Excavator undercarriage maintenance is a crucial consideration for any excavator owner. While undercarriage and track gear make up approximately 20-30% of the machine purchase price, it can account for up to half of all maintenance expenses. Track systems are amazing mechanisms. They enable your machine to negotiate the toughest terrain and in so doing they must often withstand a continual heavy beating. Here are some simple maintenance tips to keep your machine in top condition while reducing downtime costs and other unwanted expenses. First things first, you must know the condition of your machine. Check the undercarriage parts regularly and take note of any cracks, breakages or signs of excessive wear. Worn or damaged parts can increase vibration levels and accelerate wear and tear on your entire machine. It is also important to keep your log book up to date. If you know how many hours a part has been in operation for, scheduling undercarriage maintenance will be easier. Manufacturers often provide an estimated service duration for parts. Remember, it is always safer and more cost-effective to replace a worn part in advance rather than wait for a major breakdown to occur on site. Correct track tension is a fine line between too tight and too soft. When tracks are too tight, any buildup or foreign objects inside the track can cause over-tension, resulting in breakage, excess wear and de-tracking. If the tracks are too loose, excess lateral movement (or ‘snaking’) can occur, once again resulting in increased wear and de-tracking. Develop the habit of checking track tension as part of your pre-start checklist. Depending on terrain, track tension may need to be adjusted. 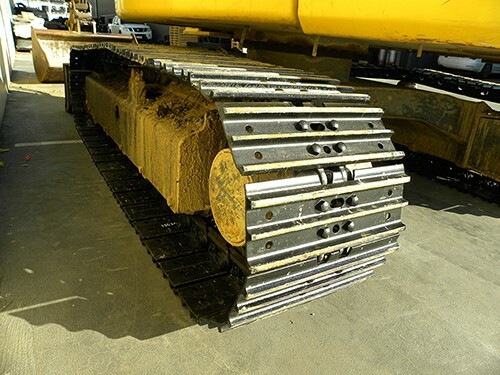 For example, when operating in heavy sand, gravel or mud you should back the tension off a little to reduce the possibility of over-tensioning. When operating on steep slopes you will normally require slightly higher tension to keep the tracks correctly aligned and prevent de-tracking. Check each undercarriage component individually. Look for oil leaks, broken parts or missing components. Keep the manual on hand to help you spot inconsistencies. Check the amount of stretch in your tracks by measuring the track pin centres and confirming they are still within acceptable wear tolerances. Also check that the bushes are not cracked or rotating in the links. Loose or flogged master pins and links are another clear warning sign of imminent track failure. Just like any machine, excavators and their undercarriage systems are made up of many individual parts. Each component must be able to function well to keep the entire system in good operating condition. The old adage about a stitch in time holds true here; just a few minutes spent checking your machine can save you many headaches in the long run. Track systems are amazing mechanisms but they are not indestructible. Be realistic about the health of your excavator. The key to avoiding downtime and minimizing operating costs is preventative maintenance. Schedule it.